[AUTO](VC) Generation Break 2 (This ability is active if you have two or more face up G units in total on your (VC) or G zone):When this unit attacks a vanguard, choose up to one card from your soul, call it to (RC), that unit and this unit get [Power]+3000 until end of turn. Magia-[AUTO](VC):[Counter Blast (1)] During your turn, when your G unit Stride, you may pay the cost. If you do, Soul Charge (1), choose up to one card from your soul, call it to (RC), that unit gets [Power]+5000 until end of turn, and at the end of that turn, put the unit called with this effect into your soul. Pale Moon's Stride Bearer is here! 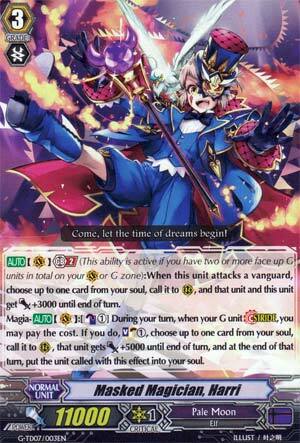 Masked Magician Harri's GB2, upon attacking the vanguard, calls a unit from the soul and gives it 3k power until the end of the turn. The On-Stride skill has the Magia keyword, and it is to CB1 to Soulcharge 1, call a unit from the soul, give it 5k power until the end of the turn, and then it vanishes back to the soul when the turn ends. Okay, at first, yes, this sounds like another temporary advantage for a cost stuff that I don't care for. But to its credit Magia is WAY better supported than Time Leap, especially with the older cards like Purple Trapezist that can actually make the advantage permanent or at the very least result in some more meaningful gains in both hard and soft advantage. Like a constantly recyclable Egg Juggler which came in the Trial Deck, hooray. The GB2? Well, yeah, has some relevance with Magia's temporary advantage and all, but if you intend to fluff a Lunatech Dragon or Blizza you'd rather just jump to Dragon Masquarade Harri (coming to you this Jan 29th). Otherwise, not much to say other than being staple for G Pale Moon. Just watch for Diablo shitting on your rear-guards. Sorry about that, I forgot to write the review for yesterday's card. Anyway, we're looking at... Oh hey! Pale Moon Break Stride! What do you do? GB2 is basically what the good Pale Moon bosses have done for awhile now, superior calling units from the Soul. At least this gives +3000 power to the unit and it doesn't need to hit to do it, so, even better. Allows for more Clown Car tricks. Magia is just a fancy way of going "take card from soul, put it in rear-guard slot, then return it to the soul at the end of the turn". Some units get bonuses for doing that, so keep that in mind. Anyway, when you stride with this as the heart, CB1, SC1 to use the Magia ability, the unit called by this effect gets +5000 for the turn and then goes away. Over-all, not bad. I dunno if this will over-take Silver Thorns, but it's nice for those who don't have Silver Thorns.